This year one of my biggest changes will be the implementation of interactive student notebooks. For those of you unfamiliar with this, the ISN is a classroom tool that is used for recording classroom notes, but it is also used to help students process new information. The idea is that it encourages students to be creative, independent thinkers while they practice new class skills. My ultimate goal for our interactive notebooks is that the students will see them as a valuable reference guide and a tool they can use to be successful in English class. I think calling them "interactive student notebooks" is a bit cumbersome, and I kind of thought that "ISN" was just another acronym to deal with (and God knows we don't have enough of those in education), so I've nicknamed our notebooks "Smash Books" named for these books used for storing mementos and ideas. 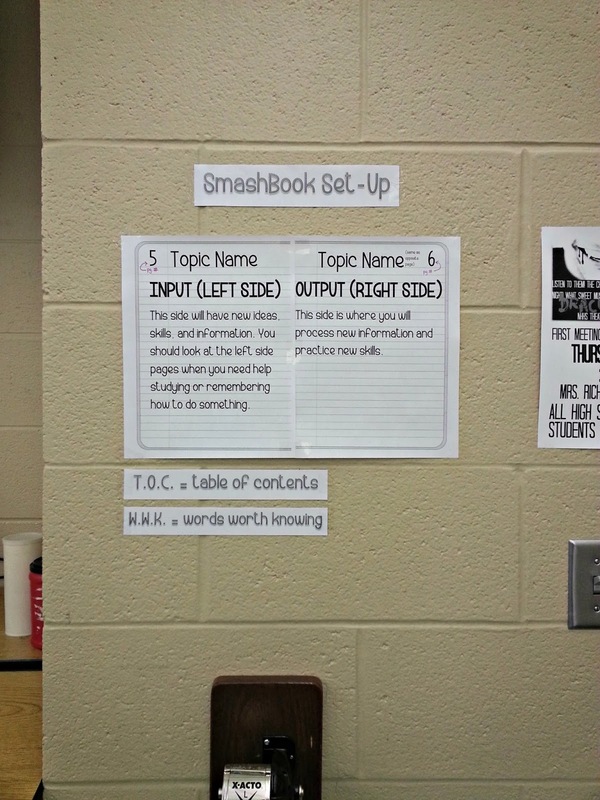 I want my students' Smash Books to be both extremely useful and personalized. I want to clarify that very few (if any) of these ideas are new or my own. 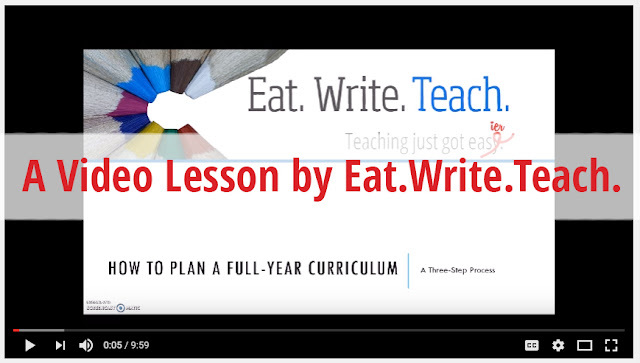 I've done a LOT of research this summer and I've found loads of amazing resources online. Pinterest is amazing. One of my greatest resources was Sarah over at Everybody is a Genius so a lot of the ideas I'm implementing (and quite a bit of the wording!) are from her site. What materials are we using for our Smash Books? Each student is being asked to supply a composition book. I like these instead of spiral bound notebooks because I think they'll last a lot longer. They're hardier. There is a bit of a drawback in using the comp book because they are smaller than standard paper, so I'm having to learn some tricks to resize printables that I want in the Smash Book. More on that later. 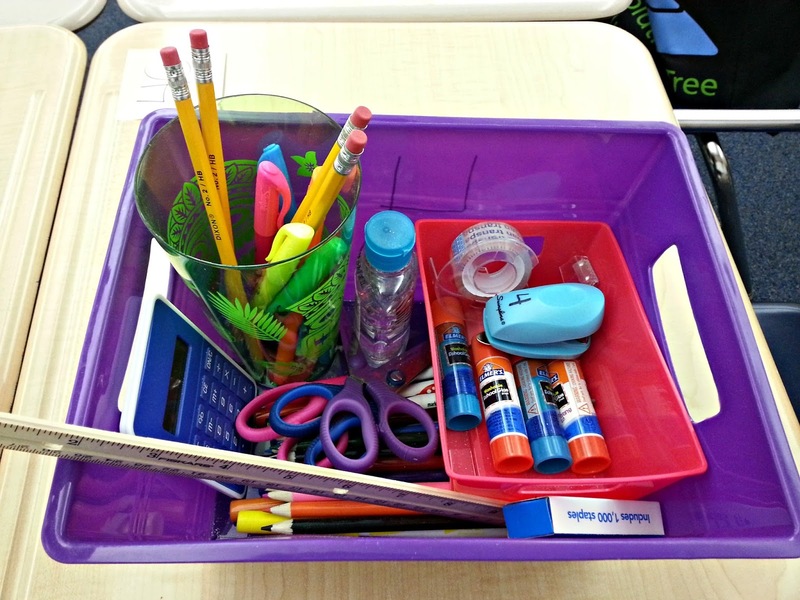 To encourage the creativity of the Smash Book, I've brought some class supplies to the table. Remember these cute little bins I talked about briefly in yesterday's post? Each pod also has a larger empty bin under the desks for collecting scrap paper for recycling. How are we using our Smash Books? The Smash Book will be used for recording our regular classroom notes, but it will also be used to practice skills and work with new information. For example, one of my early lessons is about how to annotate text while reading. The students will be putting a foldable on the left side that is a chart of annotation symbols, so that is new information. Then they will get a print-out of my Writer's Workshop guidelines to stick on the right side and they will annotate that text while reading it to practice the skill. Left side = reference. Right side = practice. I have a larger version of the above picture hanging in a prominent place in my classroom so the kids can reference back to it early on while we're still getting used to these notebooks. How do we set up our Smash Books? During the first full week of school (which I am totally calling "Boot Camp," a term I brazenly stole from Sarah at Kovescence of the Mind) we will be dedicating some time to getting to know our Smash Books. The basic set-up is pretty much identical to what Sarah from Everybody is a Genius does. The next four pages = the table of contents. Students will keep track of the topics and the page #. Again, it's supposed to be a reference item! Inside of the back cover = another reference place. 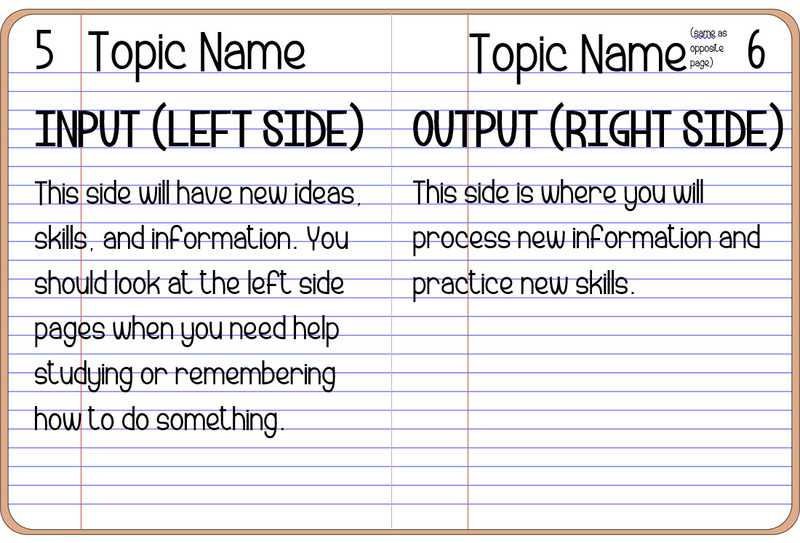 The students will glue in their Depth of Knowledge word chart and their writing rubric. Last two pages = grade record sheets. With my new grading system, I want students to keep track of how they are doing on each skill they learn. They will record those there. After the Words Worth Knowing section is when the actual page numbers and content begin. So, that's pretty much where I'm at with our Smash Books right now. I'm really excited to give these a try! What's your note-keeping method in class?